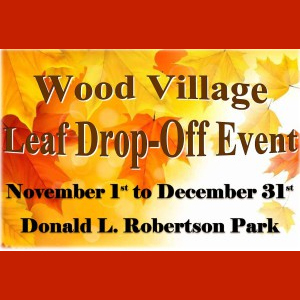 The last days for the Wood Village Leaf Drop-off Event are approaching. Start your New Year off without the yard debris of 2015! These problems can be avoided by composting leaves and yard debris or putting leaves into your yard debris can for the waste hauler to remove on your regularly scheduled collection day. In an effort to assist you, the City is providing a leaf drop off area during November and December. If you have any questions please call Marie at 503-489-6859.